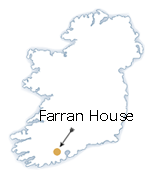 Farran House is a large, elegant 18th century, Italianate style, Irish manor house situated in the county of Cork in the South of Ireland. It is available for self catering and catered rental, with accommodation for up to 16 people. It is perfect for vacation rentals and family reunions. The house is spacious and bright and beautifully decorated and it is set in 12 acres of mature beech woodland and landscaped gardens. It is a perfect base for exploring counties Cork and Kerry. It is situated 9 miles from Blarney, 38 miles from Killarney and 10 miles from Cork city and airport.